One could make the case that Candyman is the most underrated horror film of the 90’s. 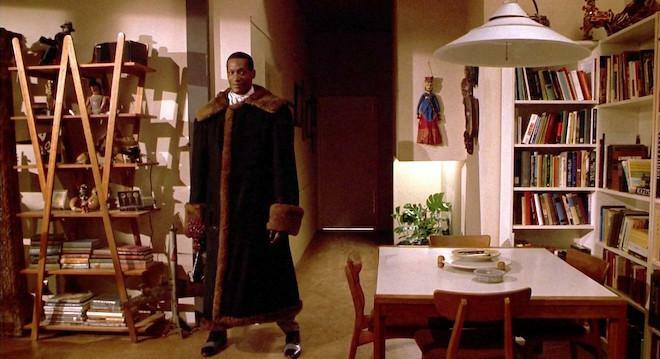 In a time where slasher films forced us into Freddy and Jason’s viewpoints, Candyman stands out as a true gem that subverts that very expectation with its constant protagonist viewpoint, never getting too cuddly with the villain of Candyman. Pair that with a shocking number of special features and a decent video and audio transfer, and I am left with no doubt that the Candyman Collector's Edition Blu-ray hangs the competition on his rusty hook and gives us a release that is Highly Recommended. You know what I miss? A good old-fashioned slasher villain. Whatever happened to Freddy and Jason? As a kid, I enjoyed the hell out of the slasher flicks that came out every October, but now they are very few and far between. We became too cuddly with our horror killers and neglected the victims. Instead of sympathizing with the victims, we were given a group of despicable people who were just meat for the grinder that would inevitably tear through them, which takes all suspense away from the film itself. But while Freddy was dying and Jason was going to hell, Candyman came out and largely got lumped into the same pile, when actually it deserved more credence than what it was given. Based on the book written by Clive Barker, Virginia Madison stars as Helen Lyle. Helen and her friend Bernadette (Kasi Lemmones) are grad students who are determined to make their college thesis meaningful by basing it on a series of murders that happened in South Chicago. Murders shrouded with Urban Legends, such as that they were killed by the Candyman. According to legend, if you speak Candyman into a mirror five times, a mythical killer with a fishhook for a hand will gut you and leave you for dead. Of course, Helen and Bernadette don’t believe in such things, so they say the magical words and nothing happens. That is only because Candyman has something special in store for Helen that will change the rules of the myth forever. Now Virginia Madison isn’t the greatest actress in Hollywood, but she does have enough cachet to elevate the material here, giving this film a strong core to lean on. I will admit she is pretty wooden, at first, as an overeager grad student. But once this plot gets rolling and she becomes the tortured soul this movie will make her out to be, she gives as nuanced a performance as any scream queen on the roster. It only takes once for Candyman to get into Helen’s mind, and from then on out, all the murders that take place involve her in some shape or form. However, it is unclear whether Candyman is there, or if Helen is just going crazy and committing the acts of violence herself. Madison is excellent at convincing us of both theories while the script and direction by Bernard Rose never tip their hand as to what is fact and what is a hellish fever dream driven by a woman that just might be going mad. Whichever reality it is, it puts us on Helen’s side, and that is a fete that very few horror films pull off. And who could blame Helen for going insane after seeing Candyman in the flesh? Tony Todd is genuinely frightening as the titular baddie. Forget the man's tall imposing stature, but his voice and how it’s enhanced is nightmarish, while at the same time oddly hypnotic. He is a creation that should go down in the pantheon of slashers like Freddy or Jason. In fact, I would say that the way in which this film is constructed makes it a more suspenseful and therefore engaging horror film than most slashers. Is Candyman real? Is he a manifestation of Helen’s broken psyche? It is pretty ambiguous throughout, and it is quite fascinating to see how far down that rabbit hole goes. 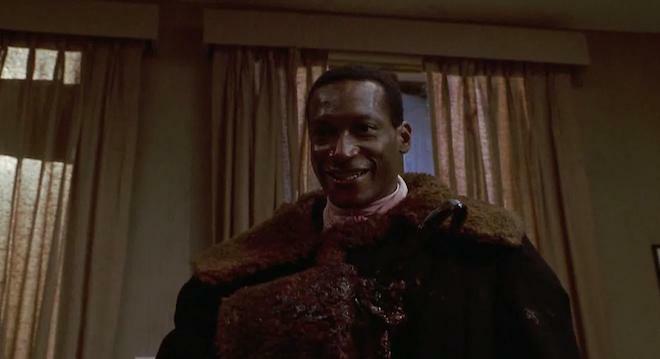 Besides a few minor issues I had with the odd relationship with Helen’s obviously scumbag husband and the performances in the first act, Candyman proves itself to be one of Clive Barker’s best adaptations. Helen’s descent into madness is played perfectly by Virginia Madison never revealing who or what Candyman truly is, if anything at all. At the same time, I didn’t care. Whatever the outcome, I was deeply sympathetic to her plight that almost seem predestined. Candyman stands out from the pack of early 90’s horror dreck, and could be in the same class as John Carpenter’s original Halloween at the top of the slasher genre. Shout! 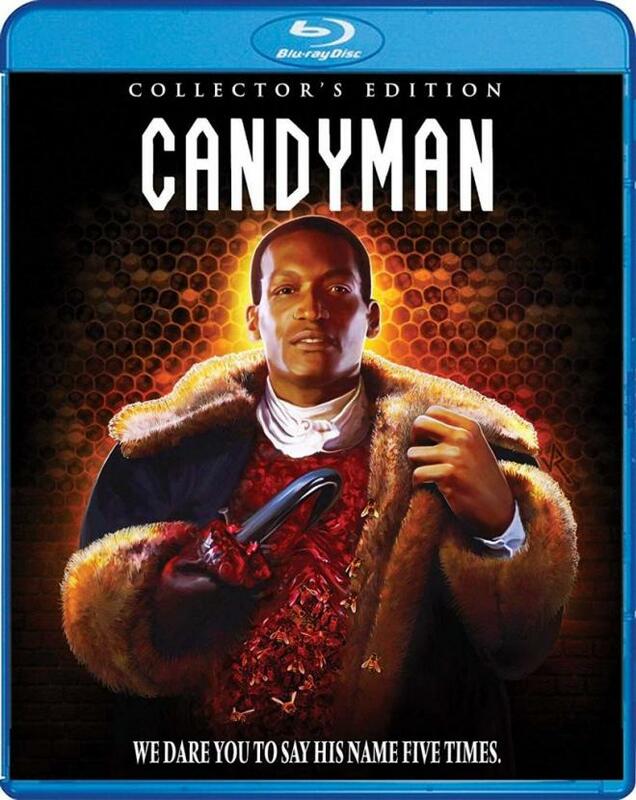 Factory brings out all the stops with this Candyman Collector's Edition Blu-ray. It features a slipcover-to-hardcover casing that displays brand new cover art that is worth the pickup alone. Like a lot of Scream Factory releases, the hardcover artwork is reversible, providing the original cover art we have all come to know as well. Enclosed lies a BD-50 Blu-ray for the original cut of the film, and a separate BD-50 Blu-ray that features the unrated version. Both versions go straight to the main menu without any trailers that let you navigate from there. 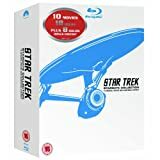 There is also a Deluxe Limited Edition Blu-ray available to purchase. The included-discs are exactly the same, but if you go that route, you get a numbered copy and early shipping as well as a couple posters and an extra slipcover. Candyman has had a long road to Blu-ray, with this being its first outing here in the states (we previously reviewed a UK import). Boasting a new 4K scan of the film and a 2K DI, this MPE-4 AVC encode looks pretty damn good depending on what version you watch. To make matters complicated here, it seems the theatrical cut of the film was supervised by the DP of the film. As for the Unrated Cut of the film, even though it was put through the same process, it was not supervised by the DP and there are some small differences that I will discuss. I am happy to report that whichever version you watch, this is a huge step up from the DVD copy I have had kicking around since the early 2000’s. Detail and clarity are strong here with the theatrical version getting the slight edge up. Grain haters beware, this was shot on 35mm with a shoestring budget so grain is heavy in both versions while only being intrusive on the Unrated Version. Closeups reveal detail in pores and freckles on faces, especially on Helen after she goes mad. Textures on environments are strong, with the apartment complex where Candyman resides being a high point featuring detail on the graffiti on the walls and the urban decay. The highlight for the entire transfer is the depth here. Specifically, when looking through the bloody hole in the wall into Candyman’s lair, foregrounds pop right out of the background and provide the kind of depth you see in some newer releases. Black levels remain deep and inky throughout, with only a handful of scenes where it becomes an issue. Whether you pick the theatrical or unrated cut, you get a solid transfer that gives a nice update from the dated DVD with the supervised theatrical cut being more refined than the uncut version. Candyman slices and dices his way onto Blu-ray with a DTS-HD 5.1 track that is a welcome upgrade from its Dolby Digital counterpart previously on the DVD. Bass response is immediately a noticeable improvement, with the classic score hitting hard through the LFE Channel. Speaker separation gets a noticeable boost as well, with swarms of bees buzzing left to right creating a more immersive mix. This is a pretty front heavy track for the most part, though the score hits the surrounds when needed. I was a bit disappointed that even Tony Todd’s eerie voice wasn’t carried over to the surrounds. I would have liked to hear more from the surrounds, but what we do get widens the field of sound and opens up the room a bit from what feels smaller in comparison; for instance, Maximum Overdrive. Vocals are crisp and clear and at a decent volume. This is a decent audio track that with a little more time could have been even better. But for what it is, it’s still a leap forward from the Dolby Digital DVD track. Audio Commentary with Writer-Director Bernard Rose and Actor Tony Todd - You just can't go wrong with Tony Todd on a commentary track. He and Rose delve deep into the lore and the changes the character of Candyman took throughout the production. It is stated that when all is said and done, the least we know about Candyman, the better for the audience to project their own fears onto him, and I couldn’t agree more. Audio Commentary with Stephen Jones and Kim Newman – A interesting commentary where two horror writers and movie enthusiasts get together and discus their takes on Candyman, and provide some insight into the film's subtext. Audio Commentary with Director Bernard Rose, Author Clive Barker, Producer Alan Poul and Actors Tony Todd, Virginia Madsen and Kasi Lemmons – You won't find too many commentaries with the writers of the source material in them, but here he is, and it is all the better for it. Clive Barker bounces his original conception with the filmmakers, and all their differences make for a very unique commentary track. Audio Commentary with Director Bernard Rose, Moderated by The Movie Crypt’s Adam Green and Joe Lynch – This commentary kind of feels like a retread of the second one, but featuring the actual director. However, they still have a whole lot of fun revisiting the film for what is definitely the lighter commentary track here. Clive Barker: Raising Hell (SD, 10:46) – A intriguing doc that has Clive Barker discussing not just his inspiration for Candyman, but what inspired his entire career’s work. As someone who has never delved too deep into Barker’s work, I found this to be quite informative. Sweets to The Sweets: The Candyman Mythos (SD, 23:49) - The usual EPK doc extended a little longer with the actors and crew talking up the film. The Heart of Candyman (HD, 7:07) – Tony Todd is absolutely gripping as he goes through what Candyman meant to him, and the differences between Candyman and other slashers. Be My Victim (HD, 9:47) – This is the first new featurette here and unfortunately, it feels like a little bit of a retread. But hey, at least we get more Tony Todd. He again talks about what the character means to him, and discloses an odd piece of trivia where he talks about the original conception of the character being an Eddie Murphy type. It Was Always You, Helen (HD, 13:11) – Virginia Maddison takes the driver's seat as she talks about the experience she had playing such a tortured character. She went deep for this one, including working with the bees in the film. I've actually never heard Maddison talk about one of her films, and here she comes across very candid and enjoyable. The Writing on The Wall: The Production Design of Candyman (HD, 6:22) – A short but interesting enough featurette where Production Designer Jane Ann Stewert talks about creating a sense of place in the film and giving it its own style. Forbidden Flesh: The Makeup FX Of Candyman (HD, 8:02) – I always love learning how makeup artists do their thing, and here it is no different; they go deep into every blood spurting artery that was spilt. A Story to Tell: Clive Barker’s “The Forbidden” (HD, 18:39) – Douglas E. Winters is a fellow writer of Clive Barker’s and he goes over the differences between the short story and the screenplay. I usually don’t like when outside writers comment on other writers' films, but here he goes into such great detail, and is so unbiased, that it subverts my usual attitude and gave yours truly some enjoyment. Urban Legend: Unwrapping Candyman (HD, 20:41) – Writers Tananarive Due and Steven Barnes have a deep and lengthy discussion on the film and what makes it unique. From the ambiguity and racial politics, no stone is left unturned and we are left engaged throughout. Reflections in The Mirror with Kasi Lemmons (HD, 9:48) – Another great interview where the actress shares her personal experiences with the film and expresses how underrated it is in the horror genre. What I found rather selfless about her is she spends just as much time talking about Virginia Madison and how good she is in the film. A Kid in Candyman With Dejuan Guy (HD, 13:36) – Yet another great sit down with the person who played the little kid in the projects that befriends Helen. He talks about auditioning as a child actor and the struggles that brings, and jokes how at the time he didn’t have a clue what the film was about. Candyman is one of the most underrated horror films of all time, and without a doubt of the 90’s. In a time where we were asked to root for the killer rather than sympathize with the victim, Candyman never takes us away from Helen and her plight. Whether she is insane or seeing things we don’t, it doesn’t matter. We are always on her side and Virginia Madison creates empathy for a character that could be seen as a serial killer depending on your perspective. As for this release, it is the absolute definitive version to own. Any fan of Candyman can’t ask for a better looking and sounding version, and the Supplemental Material here is more than worth the price alone. This is without a doubt a Highly Recommended release for any horror fan, and Shout! Factory should be proud of what they have done here.